KUCHING: Nearly all the elected representatives linked to Gabungan Parti Sarawak (GPS) as well as five from United People’s Party (UPP) yesterday attended a closed-door briefing here to prepare the new coalition to win the coming 12th state election. The briefing by Chief Minister Datuk Patinggi Abang Johari Tun Openg held at a leading hotel lasted for about two hours before breaking off for lunch. Deputy Chief Minister Tan Sri Datuk Amar Dr James Masing, who is Parti Rakyat Sarawak (PRS) president, and Bintulu MP Datuk Seri Tiong King Sing, who is Progressive Democratic Party (PDP) president, were notable absentees. It is learnt Masing was unable to attend the meeting as he is still on medical leave while Tiong is said to have prior commitments outside the state. Once-partyless Pakan assemblyman Tan Sri William Mawan, whose political future remains uncertain despite having joined Parti Pesaka Bumiputera Bersatu (PBB), was present during the meeting. PBB secretary-general Datuk Alexander Nanta Linggi, who is also GPS taskforce chairman, said the briefing was meant for the 72 GPS assemblypersons although all 19 GPS members of parliament were also invited. He pointed out similar briefings by the chief minister for the elected representatives will be held again from time to time, as GPS prepares for the coming state election which could be held within the next three years. “Of course, we touched on the coming state election which we want to prepare for now. His (Abang Johari’s) advice was for all the elected representatives to go to the ground, and to work hard and to serve the people the best that we can,” said Nanta when met by reporters at the hotel lobby. He also disclosed that the chief minister had mentioned on the status of GPS’ registration to those present at the briefing. “At the moment it (registration) is still in progress. I don’t know (how soon it will be registered), as the decision is with the RoS (Registrar of Societies). As far as we are concerned we have submitted (the relevant documents). “The latest we heard is that everything is in order and we are waiting for them (RoS) to tell us (on the registration),” he said. 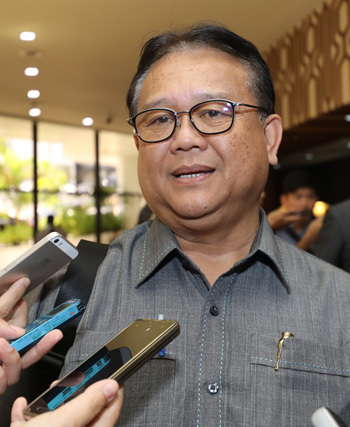 Meanwhile, Tupong assemblyman Fazzrudin Abdul Rahman said all the elected representatives were reminded by the chief minister to focus on giving the best service to their respective constituents. “It was a casual meet-up by the chief minister with the assemblypersons and members of parliament. It’s more like an ‘elder brother to younger brother’ or ‘father to a son’ session where the Right Honourable Chief Minister gave his advice, including strongly-worded ones to us to serve the people better,” he said. Meanwhile, Assistant Minister of Transportation Datuk Dr Jerip Susil, who is UPP deputy president, confirmed that all assemblymen from UPP were at the briefing despite the party not being part of the GPS fold. The formation of GPS was announced on June 12 by Abang Johari after chairing a meeting comprising leaders from PBB, Sarawak United People’s Party (SUPP), PRS and PDP. Abang Johari, who was at that time Barisan Nasional Sarawak chairman, also announced the dissolution of BN Sarawak that same day. This was following BN’s defeat in the 14th general election which saw Pakatan Harapan forming the new federal government.